New Junk City is a band that keeps randomly popping back into my life when I'm not expecting them. I had a split 7" of theirs sent to me to review a few years ago, they ended up as one of the bands on an All In Vinyl single series that I subscribed to and now a full length album has shown up at my door. 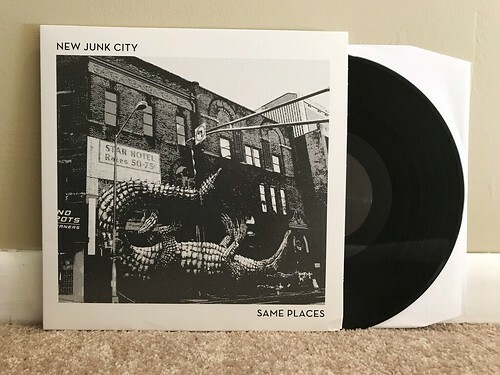 Same Places is a full length album's worth of all of the things that have made me like the New Junk City 7"s I've heard over the last several years. This is a band playing energetic, punked up pop songs. In reading the bio sheet, the label compares the band to several other bands that I don't think they sound like much. Looking around the internet at other reviews of this album, it seems like most websites are essentially copying and pasting that bio and trying to pass it off as a review. That sort of thing annoys me to no end. What I hear are gruff vocals that remind me a little bit of that guy from Flatliners, but over top of music that's significantly better than anything The Flatliners ever released. There's a certain amount of late 90s energy, in a Burning Airlines sort of way, but more straightforward and with a heavier emphasis on being catchy. Or maybe a less polished version of late era Samiam, keeping the hooks in tact, but assembling things a bit rougher around the edges. However you want to try to describe New Junk City, it boils down to the fact that the record is really good and worth checking out. I might not being paying as much attention to them as I should, but I'm happy that outside forces keep putting this band back in front of me so I don't miss out on anything.